## 4. Simulate data from a within-person experiment:  for each person, do one treatment for the first half of the experiment and the other treatment for the second half. Well, yes and no. This comes up a lot in clinical research. We see a lot of studies that show that a drug changes some physiologic measure like blood pressure or a cholesterol level. Those studies can be done rather easily, the measurements are simple to gather, and the effects are typically fairly large and emerge rapidly. But nobody really cares about blood pressure and cholesterol except to the extent that they are on the causal pathway to cardiovascular disease and mortality. And therein lies the rub. While nearly everybody believes, for example, that increased blood pressure lies on a causal pathway to heart attacks, strokes, heart failure, and death, it turns out that when you study it long enough in a large enough cohort, you find that some blood pressure reducing medications will also reduce these important complications, but others, despite reducing blood pressure itself, do not reduce the complications. We imagine this is because they have other effects that offset the benefit from the blood pressure reduction, though this is not really certain. So things like blood pressure and lipid levels are considered proxy measures. They’re a good start, but at the end of the day, they’re not what matters. Ultimately, what we really care about are symptomatic illnesses, disability, and death. And effects on those require large and long studies. It sounds to me like what you are recommending here is the use of proxy measures. Maybe not–maybe there are steps along the pathway of effect that are, in and of themselves, considered important to exercisers. And maybe there is strong science backing up the causal connections of how a treatment works in this context. But if not, all we get is a tradeoff between a really high quality answer to a question of so-so importance, or a mediocre answer to a question that really matters. I don’t think Andrew’s recommending proxy measures, I think he’s recommending considering a causal process and trying to measure additional factors that enter because of that. For example, suppose you think repetition to exhaustion is important (ie. you should barely be able to make the last lift). Why is it important? How important is it? Consider doing experiments where you sometimes do this and sometimes don’t, and track how it affects the different groups. Or suppose you think higher frequency (days per week) is better than high intensity (a long time and high weights) or something. Now try a variety of frequencies, and a variety of intensities, and see if you can fit a model that makes sense. That’s very different from “try measuring how much metabolite X there is in the blood after lifting” and use that as a proxy measure for how strong you’re getting. That’s a really cool post! It works just on its own to introduce R, the various Stan packages (I’ve never used those and now feel compelled to do so), fake data simulation, study design and visual and statistical data interpretation. 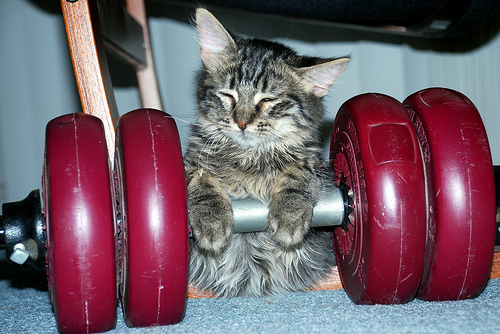 The image looks like the weight is lifting the cat (or at least, its front paws), not vice-versa. Andrew once lamented that it’s hard to google “stan”… but it’s even harder with “R”.